Laser Safety Curtains from Steel Guard Safety utilize a specialized B-35 laser curtain material to stop stray laser plume and radiation from Class 3B and Class 4 lasers in industrial, medical, surgical, and military safety applications. All Laser Safety Barrier Curtains are Certified CE and approved per ANSI Z136.8-2012 as well as NFPA-701. Curtains and Screens can be used to block lasers of all wavelengths between 180 and 10600 nm. Stops Stray Laser Plume Inside the Laser Control Room, And Direct Beam Hits From Escaping. Protects Onlookers Outside the Laser Room from Needing PPE. All Laser Screens & Curtains are CE marked and Certified ANSI Z136.8-2012 and NFPA-701 Specifications. Danger Sign to Prevent Unwanted Entry and Safe Passage. Laser Safety Barriers are Custom Designed for your Size, Application, and Type of Laser. Velcro Attachments Allow the Laser Barriers to Connect Modularly to Each Other. Flexible Mounting Options Including Suspended, Ceiling, Wall, or Floor Mounting, as Well as Portable Frames. 2.5 oz to 3.75 oz Sq/Ft (Up to 33.75 oz Sq/Yd)- 52% Polyester and 48% Cotton with a Proprietary Coating. Meets NFPA-701 and ASTM Standards. #2 Stainless Steel Toothed or Black Plastic Grommets are spaced every 12″ on center of the curtains to hang securely on the roller hooks. 2″ Velcro side attachments easily seal and attach both sides of curtains to multiple curtains. Available in standard 2′ swatches, full length or custom. (Optional, Extra) Heavy-Duty 3/16″ Galvanized Chain inserted into the 4″ bottom pocket to stabilize the curtain against drafts. Heavy-Duty 16 gage roller track system which connects track lengths to your desired shape and length. (Dimension O.D. – H-1.25″ x W-1.44″) Available in Suspended Mounts – Threaded Rod or Beam to Chain, Ceiling, Floor Mount, and Beam Flange Mount. Make for easy sliding and folding of the curtain. 2-wheel steel roller hooks are available for large curtain systems. Available Sizes up to 40′ in height. Normal recommendations of only up to 20′ widths for easy installation – Multiple curtains can be attached with velcro. 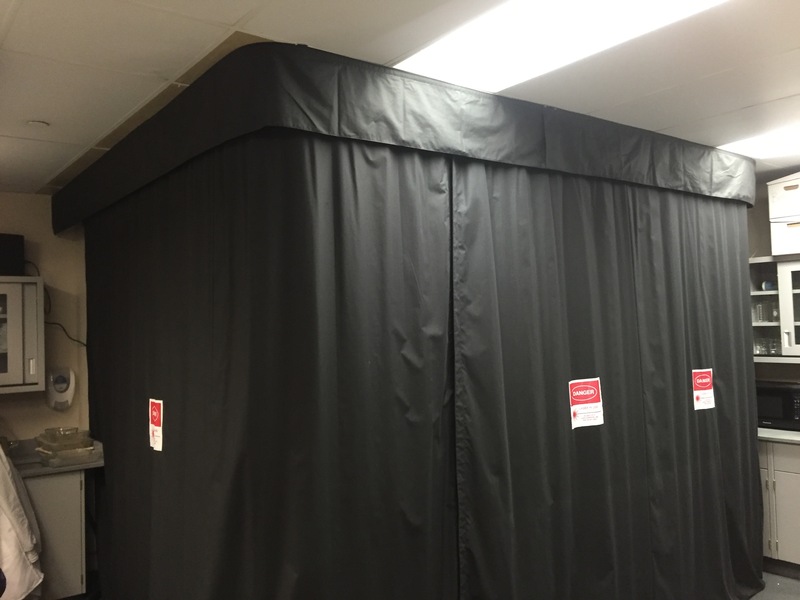 Upper Laser Curtain Valance Panels (Stationary) for Aesthetics and Need for Complete Blackout Stationary Curtain Panels – Custom made to Ceiling Design -Ideal when the top half of an area does not need to be opened and contaminants need to be sealed off.